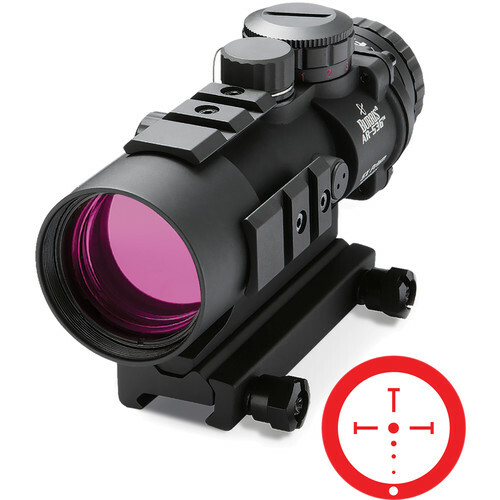 The 5x36 AR-536 Red Dot Sight from Burris Optics is designed as a 5x magnification optical sight with a Ballistic CQ 5.56 black reticle that features red and green illumination with 10 brightness settings for each color. The reticle dots correspond to bullet drop from 5.56 or 7.62 rounds. The optics are anti-reflective and fully multicoated and the reticle is etched directly onto the prism. The illuminated sight is powered by a CR 2032 battery and comes ready to be mounted on a Picatinny rail system.